Instead of £138.00. You save £6.90 due to the online discount . With a flexible barrier system, you can react quickly to increased transport volume or short-term renovations. Fixed wall straps allow you to quickly shut off the affected areas for pedestrians as needed. From time to time, entrances to businesses or warehouses must be temporarily blocked and pedestrians redirected. When this is the case, a highly visible barrier is essential. With a wall belt mounted in a sturdy cartridge on the wall, you can act spontaneously in such situations to set up an effective barrier in seconds. The polyester belt strap is stored in an aluminium cartridge that is securely mounted to the wall. 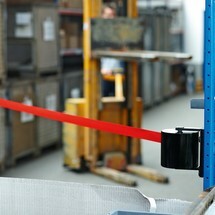 To use, pull the self-tensioning barrier belts straps smoothly out of the cartridge and connect them with a hook to a wall mount which can be ordered separately. The belts are available in 5 different lengths from 2.30 m to 20 m. These enable you to block individual access points as well as to create large-scale barriers around entire warehouse areas. The integrated centrifugal brake ensures that the belt strap is returned to the cartridge in a controlled manner. 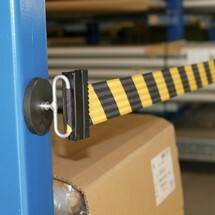 Order the versatile barrier wall belts for connection from our shop.